Re:Down® is a supplier of recycled down for numerous brands in the outdoor industry. 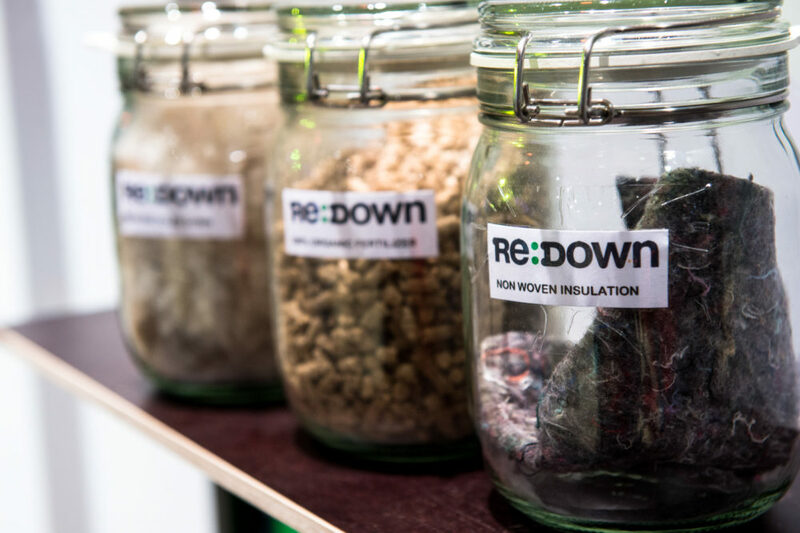 We started to present Re:Down® on our showcase for the first time in 2015, when we looked into down products and alternatives. This year recycled down is ever so suitable to contribute to the subject of material solutions. Recycling down enhances the lifespan to an already natural product and contributes to an overall positive ecological balance. The challenges which arise from recycled materials, like chemical contamination with unidentified substances are handled through an extensive and well conducted washing process, which leaves the down in an immaculate natural state. Hear all about Re:Down® at their presentation on Sunday the 3rd of February at the guided GRV Transparency Tour at 11.00 am. Down and feathers are a precious gift from nature. It looks fragile but it is durable. Though the resource itself, the supply, is fragile due to our mass consumption habits. It is up to us to take care of it. Re:Down® recycles down and feathers extracted from post-consumer goods so that they can be re-used as filling material in apparel, sleeping bags or bedding products. Re:Down®, offers only down and feathers from post-consumer goods, with no new animal input, which means, that the raw material does not come from slaughter houses. The management of textile trash is one of the big challenges for all developed countries. Just in Europe, we estimate the amount of annual textile waste to 7.500.000 tons! Down and feathers filled products are only a fraction of this but still an enormous quantity. 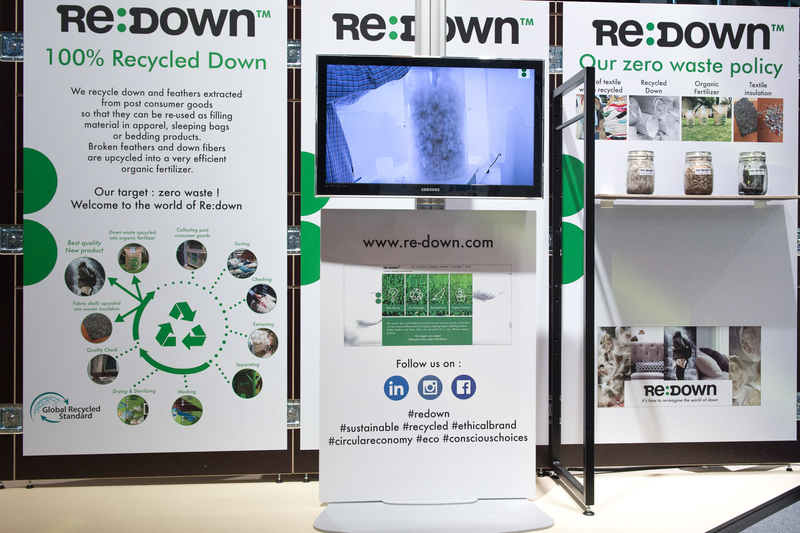 Today Re:Down® recycles 97% of what they collect but their target is: zero waste! Broken feathers and down fibers are up-cycled into a very efficient organic fertilizer. The fabric shells (around 30% of the total weight) are chopped into small pieces and end up in non-woven insulation. Water can be an issue in recycling. But the Re:Down® recycling process use far less water when reprocessing the down, then washing virgin ones, because the raw material has less fat residues compared to virgin down. On top of that, raising more animals and operating slaughter houses uses a substantial amount of water, which Re:Down® has no part in. The used water from the specialised washing process goes through a water recycling system and is sent back to earth as clean drinking water. Re:Down®’s recycling process uses no chemicals. The sterilisation happens through high temperature. And during washing Re:Down® only uses soap. Even for the special water-resistant finish, we exclusively use an ecological FC free formula. Last but not least, 30% of the electricity used in the factory is produced by solar panels. The aim is to bring it up to 70% in the coming years. Re:Down® Water-Resist is a treatment developed by the brand to make the down water-repellent so it absorbs less moisture, dries faster and keeps its loft and thermal properties even in wet conditions. Re:Down® Water-resist is an ecological formaldehyde-free recipe with no fluorine. Re:Down® was co-founded by Eric Firmann and Tae Hwang, both having 20 years of experience in the textile industry. Re:Down® collects those old post-consumer products mainly from textile waste collectors in Europe before they end up in the landfill aiming to create a positive change for the environment providing alternative solutions to virgin down.